Khan Academy is a place where you can “Learn almost anything for free.” In the case of their presentation on Robert Rauschenberg’s Bed, 1955, you get what you pay for. Dr. Beth Harris and Dr. Steven Zucker discuss the work for just under five minutes. I have to say that their presentation demonstrates little actual critical thinking or research about the artwork. They begin by referring to the work as a “combine” as if that is a standard art historical category. 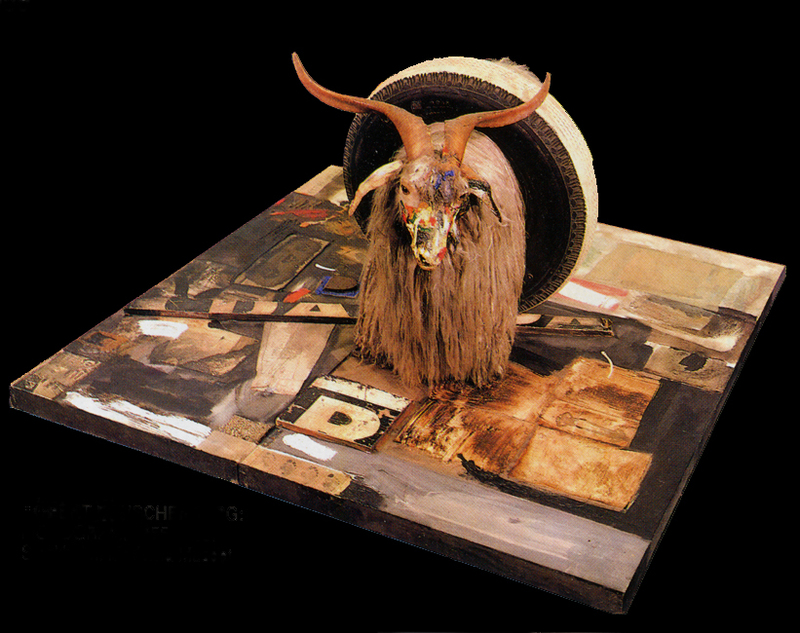 They do not mention that Rauschenberg invented the term (not the word itself, but the art term) “combine” specifically to describe this kind of combination of painting/sculpture that he was making. And Jasper Johns never said anything like that. Sure, “Johns and Rauschenberg” were the enfants terribles or dynamic duo of the late 1950s, but the viewpoint/outlook/meaning in their work is very different. It seems that Zucker isn’t familiar enough with the work of Johns and Rauschenberg to notice the gap between the two. Where the hell did he get that idea??? I’ve never seen such a statement from Rauschenberg in any literature. If you want to connect Rauschenberg with Abstract Expressionism that is fine (and Barbara Rose has done a good job with that). But if you want to pick an AE artist to connect with Rauschenberg, make it Willem de Kooning! After all, it was de Kooning who gave Rauschenberg the drawing that he erased (Erased de Kooning Drawing, 1953, collection of San Francisco Museum of Modern Art). And, more importantly, for anyone who actually looks and thinks—Pollock’s drips land on the floor and solidify there. De Kooning’s drips ooze down from the brushstroke that sweeps across the canvas when it is oriented vertically. And in Bed, Rauschenberg’s brushstrokes have obviously been applied when the “bed” was vertical! And the drips drip down. Zucker finds that Rauschenberg, in utilizing what Zucker thinks is an act of copying the AE style, is “self-consciously imitating the idea of the authentic.” Harris responds, “By virtue of copying what is supposed to be someone else’s individual style.” Seems to me that Zucker and Harris are looking through some strangely distorted art theory post-modernist lenses here, so that they don’t understand Rauschenberg as a painter who actually enjoys the materials he uses as much as any other painter of the time. 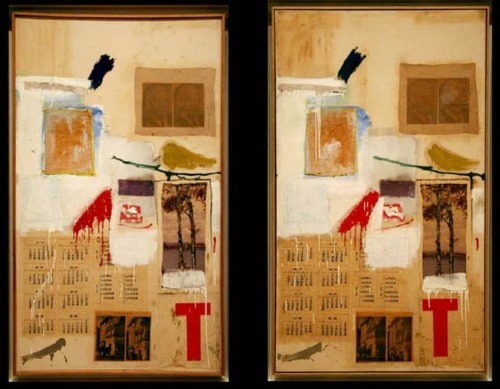 The paint in Rauschenberg’s work is applied with Rauschenberg’s actual style, not an “imitation” of a generic style. Or maybe Z&H think that anyone who lets paint drip after de Kooning and Pollock is inauthentic. Which seems to be a comment on original/copy, similar/different, same/not same, etc. Anyone but careless speakers would have noted that. *A really great discussion of Rauschenberg’s work is Encounters with Rauschenberg by Leo Steinberg, unfortunately out of print, but available used at a reasonable price. Back in the olden times, when I was in college, we didn’t register for classes online. We stood in long lines in the gym at Portland State and waited our turn to hand paperwork to an actual person. That was in order to register for one class. Then you’d get into another line to register for another class. In order to keep the lines manageable each student was given a time during registration day when their registration packet would be available. If you were lucky the registration lottery would give you an early time so that all your desired classes would be available. In the fall of 1968 I got a late registration time. I was a sophomore graphic design major and I needed the required Lettering class in order to meet prerequisites in the program. By the time I got to the line, all of the Lettering classes were closed. I was 19 years old and too naive to know that I could probably beg a teacher to get in because I really needed the course. So, I made the decision to be a painting major instead. And on that decision turned the whole of my life since. Otherwise I would not have had the experiences enumerated on the “About” page on this site. Nor would I have met most of the friends that I now have. And I probably wouldn’t have met my wife, Susan, or our two children. So that’s how key decisions are made. For quite awhile now I’ve noticed, especially with the evening news (any channel) that oftentimes “everyone” doesn’t do something. Let me know when everyone does agree. We have a habit in writing articles published in scientific journals to make the work as finished as possible, to cover up all the tracks, to not worry about the blind alleys or describe how you had the wrong idea at first, and so on. So there isn’t any place to publish, in a dignified manner, what you actually did in order to get to do the work. When my son was in 4th grade he had a teacher who liked to bike to school. One day as he was on his way some dogs began to chase him and he sped up to try to elude them. Unfortunately his attention to the dogs left him inattentive to the large mirror on a parked truck and as he hit the ground he broke his shoulder blade in several places. That kept him out of school for a few days. He also broke his helmet.